In a move that must have Emily Post spinning in her grave, Amazon has patented a “System and Method For Converting Gifts.” The System allows you to convert that piano scarf Aunt Mildred bought you into a Blu-ray box set of It’s Always Sunny in Philadelphia, before you even see the scarf. 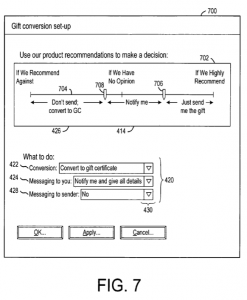 The patent also discloses a “Gift Conversion Rules Wizard” that allows you to set up rules, such as “Convert all gifts from Aunt Mildred into gift certificates,” “Convert all DVDs to Blu-ray,” “No more Green Lantern stuff,” etc. Thus, as shown in FIG. 7, a number of ranges may be defined using the sliders 706 and 708. For example, if the website system 104 recommends the gift for the user, and the strength of the recommendation is greater than the level set by slider 706, the gift is sent to the user without first checking with the user. 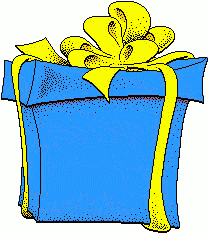 On the other hand, if the website system 104 recommends against the gift for the user, and the strength of the recommendation against is greater than the level set by slider 708, the gift is converted to a gift certificate without notifying the user. 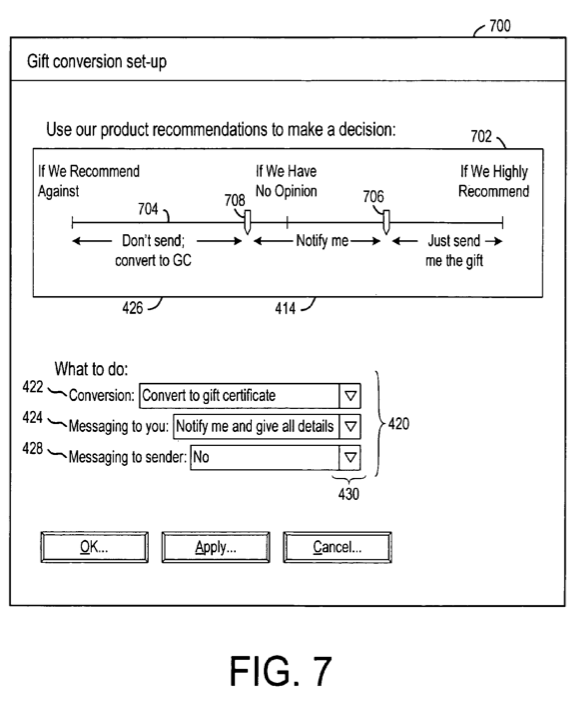 Finally, if the recommendation is somewhere between slider 706 and 708, the user is notified, and the user provides a decision as to whether the gift should be converted to a gift certificate. While I certainly see the advantage to Amazon in not having to deal with the return of tens of thousands of unwanted items, the whole idea is rather unsettling. There is something to be said for learning to graciously accept a gift that you would not have otherwise purchased for yourself, to appreciate the sentiment of the giver having taken the time to select a gift he or she felt would make you happy, to interact with the giver and acknowledge their thoughtfulness. While I see no harm in setting up a rule to convert an extra large sweater gift to a medium sweater gift so you can actually wear it, converting less than optimally desirable gifts to gift certificates surely embodies the antithesis of the season. Posted in Internet Law, Iowa Law. Tagged with patents.